It was a complicated story, but here are the highlights: at the close of Election Day 2008, Minnesota's incumbent senator, Republican Norm Coleman lead the race by just over 200 votes. By Minnesota law, a margin under one half of one percent triggers a mandatory recount in the Senate race. On January 6, after a certified hand recount, officials declared that Al Franken would become the junior Senator from Minnesota, by 225 votes. I am going to repeat that number because it is worth reiteration: the difference was a little over 225 votes. Out of a total of 2.9 million. A large part of the Election Day discrepancy was attributed to absentee ballots that were rejected and never counted. Local election judges made these decisions on a largely subjective basis. Al Franken's campaign asked those responsible to re-evaluate the reason for disregarding a ballot and consider if some of them should have been included in the count. The decision to count a previously rejected ballot needed to be unanimous, among the election officials and both campaigns. There were 1,350 absentee ballots reviewed and the parties agreed to open and count 933. 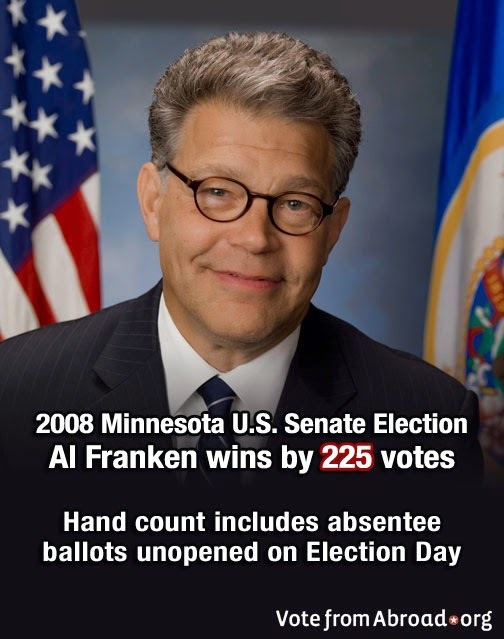 Al Franken gained 176 votes from the erroneously rejected pile. There were other recounts and The contest did not end on that day in early 2009, but would be resolved months later after several court rulings on a variety of objections, some of which were decided in Coleman's favor, others in Franken's. Senator Franken is in another close race this year as he runs for re-election. Tweet Al Franken → your support from abroad. 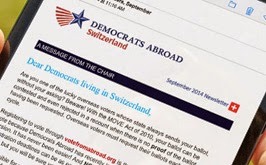 The Minneapolis Star Tribune referred to the entire pool of 12,000 rejected mail-in votes as "Absentee ballot heartbreak," an allusion to a statement made by Minnesota Secretary of State Mark Richie. It is a tragedy that the system's complexity should result in any voter disenfranchisement. Before, during, and after the recount, a standard procedure for accepting or rejecting absentee ballots was never applied. Duchschere, Kevin and Mike Kaszuba. "Senate race certification set for Monday with Franken up 225 votes." Star Tribune. Last updated January 4, 2009. "Mining the Minnesota Recount." FactCheck.org. Last updated April 16, 2009. "United States Senate election in Minnesota, 2008." Wikipedia.org. Last modified October 5, 2014.